This “classic” Rebel bass boat will be on display at the Bassmaster Elite fishing tournament this weekend at Lake Hartwell. This fully restored Rebel “Fastback” bass boat owned by fishing enthusiast Doyle Hodgin was used in the first Bassmaster Classic in 1971. One of the original boats used for the very first Bassmaster Classic in 1971 will be on display during the Bassmaster Elite Series tournament on Lake Hartwell, scheduled for April 4-7, at the Green Pond Landing and Event Center in Anderson, S.C. Manufactured by Rebel, the No. 17 inboard-outboard bass boat equipped with a Rebel Rambler trolling motor was used by Dennis Pope of Haysville, Kansas, during the 1971 Bassmaster Classic held at Lake Meade in Nevada. Pope finished 17th in the Angler of the Year standings that year, the basis for the boat numbers. The boat is now owned by Doyle Hodgin of Hurdle Mills, N.C. Hodgin will be bringing his boat to Anderson for the Bassmaster Elite Series, where it will be on display during the weigh-ins on Thursday and Friday and during the Expo on Saturday and Sunday, from noon to 5 p.m.
A B.A.S.S. member since 1972, Doyle Hodgin was at first skeptical of the claim that a Rebel-produced boat had been used in the first Classic. Hodgin has been a member of B.A.S.S. since 1972 and prides himself on knowing the history of the organization. When he first saw the boat, almost by accident, while running an errand, he was initially skeptical of the claim by the owner that the boat had really been a part of the 1971 Classic. First, the boat was a Rebel, and Hodgin assumed all the early Classic boats had been Rangers. But after doing some research, he found a Rebel history page which said that Rebel was not only limited to lure making. In 1971 the company had begun making bass boats, and Rebel did, in fact, furnish the boats for the very first Bassmaster Classic. The boat, which Hodgin purchased for $3,000, had been kept inside a building almost its entire life, and was in good condition. He spent two years restoring it to its original shape. Carpet had been laid over the original fiberglass deck, and Hodgin said he painstakingly removed the contact cement that held the carpet down, a process that took months. Most of the boat is in original condition. It has original seat cushions, original engine and the original Lowrance sonar. 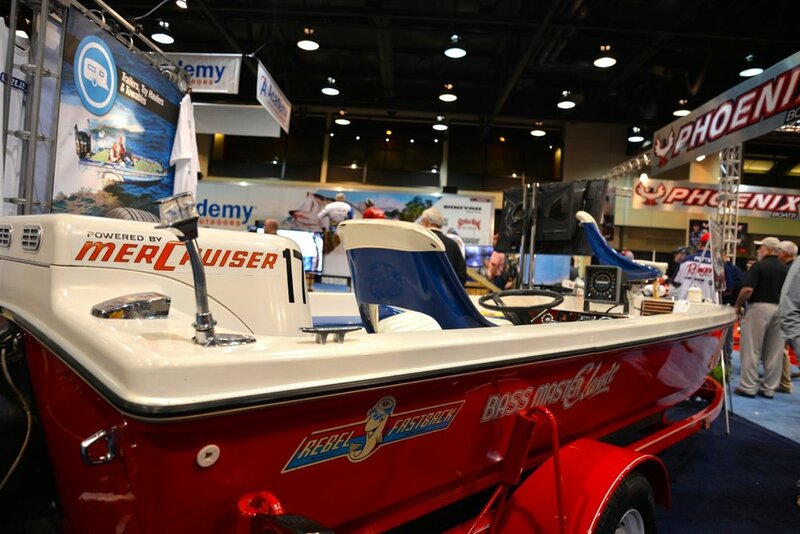 The bright red Rebel is a popular draw at Bassmaster events. “People love to see it,” said Hodgin. “Folks who have followed bass fishing for any amount of time, especially those over 40, they feel a real connection to the boat. Hodgin spent six years on the pro bass-fishing tour himself, so he feels a special affinity for the boat, and he’s gratified by how much delight folks receive from being around it. Lake Hartwell, listed as a Top 100 Bass Lake in America has hosted the Bassmaster Classic three times: 2018, the “Second-Most Attended Classic” in history; 2015, the “Coldest Classic” in history; and 2008, which received 11.5 hours of TV coverage on ESPN2. Daily takeoffs and weigh-ins will be April 4-7 at Green Pond Landing and Event Center, 470 Green Pond Road in Anderson. Check out bassmaster.com for event times. An Elite Expo will be held at Green Pond Landing Saturday, April 6, and Sunday, April 7, featuring numerous promotions and events. Coming up later this year is the Bassmaster B.A.S.S. Nation Championship, set for Nov. 6-8 on Lake Hartwell. The Bass Anglers Sportsman Society (B.A.S.S.) is a fishing membership organization with more than a half a million members. It is geared toward bass anglers, mainly in the United States but with members located worldwide. The society publishes Bassmaster magazine and other related publications and produces The Bassmasters weekly television program. B.A.S.S. is best known for the sport fishing tournament trails it sponsors, and for the championship event of its primary series, the Bassmaster Classic. Mar 8 It Takes a Nation . . .